Best of 2008: Someone dropped in an extra zero, right? RIGHT? Posted on October 16, 2008. 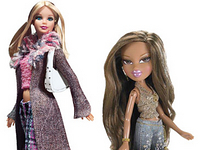 Two toy companies battling for rights to the Bratz dolls-with-attitude have racked up legal fees of at least $93 million in the case. MGA Entertainment has spent $63 million in fees since 2004 defending a lawsuit by Mattel Inc. that contended the doll’s designer conceived of the idea before leaping from Mattel to MGA, the Daily Journal reports (sub. req.). Plaintiff Mattel has spent $30 million in just the first half of the year, the story says. Mattel was awarded $100 million in the case, far short of the more than $2 billion in damages it had sought. The Daily Journal got MGA’s figures in a lawsuit it filed against its insurers seeking full payment of the Bratz fees, while the publication got the Mattel figure from a stock analyst. MGA Entertainment has spent $63 million in fees since 2004 defending a lawsuit by Mattel Inc. . . . Plaintiff Mattel has spent $30 million in just the first half of the year, the story says. That $30 million was just the first half of ’08! That means Mattel spent WAY more than $30 million since the suit began in ’04, and that the total legal fees must have blasted way, way past $100 million since the case began. Is there anyone out there who can even remotely do this math and explain how you can get to numbers like this — not how they can be justified, for, given the business interests involved, they are not irrational. But how many widgets, and of what kind, does a law firm have to spit out to get to these kinds of numbers on a trademark case?